Back in the early 1990s, The Humanist magazine interviewed the famous producer Gene Roddenberry, creator of the TV show Star Trek. The first series had been off the air for years and was long into syndication. Roddenberry was in the process of cranking out its eagerly-awaited sequel, Star Trek: The Next Generation — soon to prove yet another great hit. The interviewer got the famous producer chatting about the relationship between the show and his own secular humanist beliefs. Now, that’s interesting, isn’t it? He was not at all apologetic about embedding messages in his TV shows and movies. And the reason was common sense: you can’t help being what you are. Sure, a person can take on a false persona — pretend to be someone else, play “politically correct”, propagandize, or give the people what they want — but if you are a sincere person, an authentic person, you can only present things as you think they really are. You can only argue from your own worldview. You can only say what you actually think. You can only create out of the reservoir of what is really inside you. That’s why Roddenberry wasn’t apologizing. He didn’t feel guilty about it. He was being consistent with his own beliefs. Of course, you could point out that he was sitting opposite an interviewer from The Humanist, and so possibly he could have been catering to his audience. Maybe. But I think Roddenberry was actually telling the truth. We can only speak from what we truly believe. The rest is mere chicanery. Now, isn’t it funny that so many people today don’t see how that applies to Christians? They expect us to hold back on expressing our beliefs, never to impose our views on others, pass moral judgments, quote scripture or otherwise “proselytize” or “force our beliefs on them”, as they are so fond of putting it. Instead, our faith is to be worn like our underwear — hidden beneath everything else and not a subject for polite conversation. So for now anyway it’s not an unpardonable sin to believe what you will. Believe in God. Believe the Bible. Believe in Jesus Christ, in salvation, and in heaven and hell. But for goodness sake, don’t tell anyone about it. If, like Mr. Roddenberry, we genuinely believe what we say we believe, then how could we be like him — authentic — and not speak what we know? Did you want us all to be phonies? Did you want us to smile and say it makes no difference to us what happens to you? Did you want us to be embarrassed that we know God, that we love his word and believe in its truth? Did you really want us to grin at you in public, and under our breath say, “Go to hell”? What else can we speak but what we know? Who else can we be but who we really are? How can we be silent in the day of good news, when the night soon comes when no one can work? And how can we listen to what you people tell us to do when the word of God rings in our ears: “go into all the world and preach the gospel”? Did you want us to be something we are not? Did you want us to be phonies? And yet, isn’t that the very condemnation they level against Christians? We’re phonies. We’re not what we claim to be. We’re not as sincere, kind, unselfish and so on, as people who say they believe what we believe ought to be. We’re all hypocrites, they say. How ironic that they reject us both for being too Christian and for not being Christian enough. There’s simply no pleasing some people. But hey, if we’ve got to pick between being a sincere Christian and being no Christian at all, the choice is easy. Alright, let’s take them at their word. Let’s be more Christian. And if they complain, tell them Gene Roddenberry says it’s okay. But Mr. Roddenberry’s response has one more insight for us, and this one goes to Christians themselves: If you really can only be what you are, what are you being? Take a look at yourself. Your life is a product of the creative process, of decisions and choices made by you on behalf of what you believe is ultimately true, good and right. How is your life right now lining up with what your head is telling you is true? Do you have friends and colleagues with whom you’ve established cordial but distant relationships, never ever risking a push to see if you can reach them on a spiritual level? I don’t mean cornering them and preaching, just becoming ambitious for them to have the same joys and blessings you have from your relationship with Christ. Are you doing what’s best for them, or what’s best for what they think of you? And your kids: Do you preoccupy them with programs, sports, social activities and academic plaudits? Do you encourage them to work for the wages that don’t last, or do you encourage them to take risks for God? Would you be content if they gave their lives to Christ, whatever happens, or would you prefer to see them become fat, rich and indifferent, so long as they remained secure? Your personal life: Do you get up each morning and give time to the Lord, or do you rush off to work as if you can get everything done just fine with no help from God? Are you self-sufficient or God-dependent? Do you pray? Do you serve? Do you cultivate the precious spiritual gifts God has given you, or do you let them lie fallow? Are you a supporter of God’s people? Do you pursue deeper commitment to him? Do you actively seek out places and ways to grow in the knowledge of God? Are you sacrificial? You see, everything we do is “Us on Life”. If Gene Roddenberry couldn’t be blamed for putting his ideology into his creative activities — if they were just an expression of who he was — then the same is true of you. What you really believe is being modeled every day by your actions. What you think you believe, well, that’s a different matter. What we believe and who we are a seamless garment. We may think we love God, but it is only by our fruits that we are truly known. You remember the fruits, right? The metaphorical ones that every Christian is supposed to be producing? How are you doing on that? So what have you been creating lately? Where did you get your ideas to do it? On what did your draw for your motivation? And what messages did you send about the true and the good when you did it? The Lord told us, “Either make the tree good and its fruit good, or make the tree bad and its fruit bad; for the tree is known by its fruit”. What he meant is this: if you’ve got an apple tree, there’s only one thing that makes you call it good or bad? … the fruit. You could have a beautiful, huge, well-proportioned tree that is a wonder of aesthetics. But if it produces small hard apples or none at all, then as an apple tree, it fails. Likewise, you could have an apple tree that was small, ugly, scarred and stunted; but if it regularly produces huge crops of luscious, juicy apples, well, that makes it a good apple tree. The fruit defines the tree; it’s only as good as its fruit. There’s really no other standard. 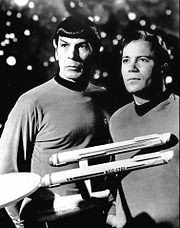 I always enjoyed Star Trek. But even as a kid I could see how each episode was designed as a little lesson in some moral point — like when Kirk “conquered” the Greek gods, or when Picard lectured Q on the supposed future of human evolution. It didn’t hurt my enjoyment, and in fact it always gave me things to think about … whether they were things I agreed with or not. And I don’t accuse Mr. Roddenberry of being a manipulator, a phony or a propagandist: he was who he was, and said what he felt he had to say. He does not stand or fall to me, but to his Maker. As television has aged — and as I have aged — the messages have gotten more subtle and sophisticated. Sometimes you can hardly see them anymore. But if Roddenberry was telling the truth, you can bet your eye teeth they’re always there. What we create is a product of our worldview. So what have we been creating lately, and what does it say about what we really believe? For ultimately, whatever we do is simply an expression of “Us on Life”.